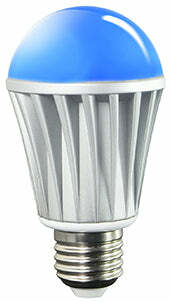 Our best selling Bluetooth bulb for the last two years! 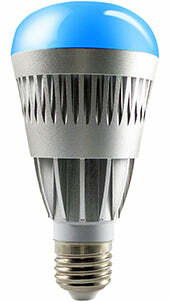 Our brightest traditional style home WiFi bulb, shining with a cool silver exterior! Introducing our lineup of MagicLight Bluetooth Bulbs! All smart bulbs are controlled through your smartphone using our free app. Our high-quality color-changing bulbs are tested to last over 20,000 lifetime hours. Our Bluetooth LED bulbs will provide you with about 80% energy savings compared to its’ incandescent equivalent. Ranging from our 60 Watt equivalent original bulb, all the way up to our 80 Watt equivalent Pro bulb, we offer the largest selection of the highest quality bulbs on the market. Like All MagicLight products, our Bluetooth Smart Bulbs are multi-colored and energy efficient and can enhance any setting. MagicLight bulbs have over 16 million dimmable color options plus multiple shades of white, from cool to warm tones. You can connect up to 50 MagicLight Bluetooth bulbs, and you can easily control them remotely with your smartphone or tablet. If you’re looking for a whole home option, consider our Bluetooth Mesh Bulb here. Set up is quick and easy with no hubs or bridges requiring connections. Just install the Bluetooth Original Bulb into your lamp of choice, download the free “MagicLight BT” app and enjoy the results. Features include scheduling options, syncing to music, a built-in memory function and 20 pre-programmed modes like crossfades, strobe, etc.